Well, I found myself in Brooklyn again. This time was far enough away that I caught people giving me funny glances as I walked around the streets. While it is in Williamsburg, it is definitely in the back of Williamsburg. Back here is where the Wicked Witch of the West summers. The rat from Teenage Mutant Ninja Turtles has a place here. Have you seen PeeWee’s Big Adventure? This is where Large Marge lives. However, nestled within this barrio is a little taquito of holiness called Humboldt and Jackson, serving up excellent All-American drinks and snacks. It’s crafty. Now, the weenie itself. 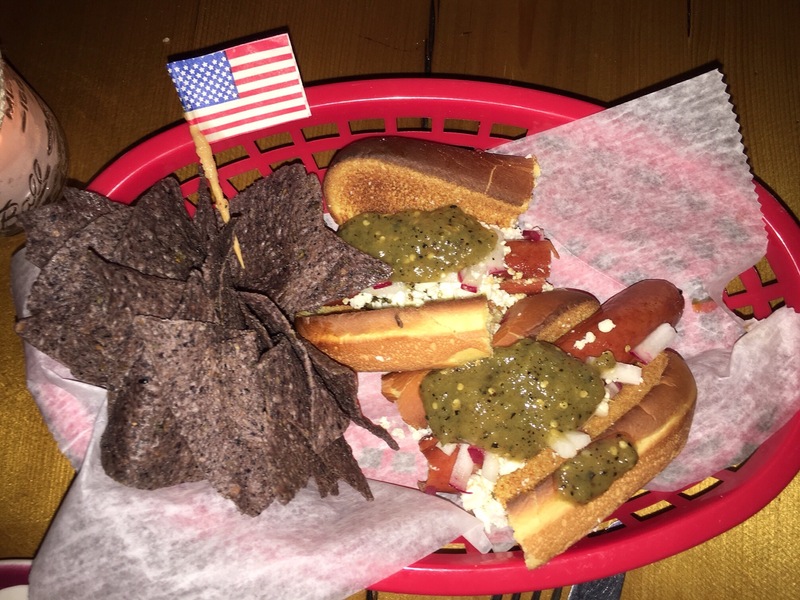 The Chili Verde Dog. H&J is all about small market beers, and they keep constant with that theme in their hot dogs. The weenie itself is from Brooklyn Hot Dog Co., a local sausage maker. If I knew that was a profession that I could tell a guidance counselor in elementary school, it would have been on the top of my list. Not only is it local, it tastes damn good. Note to self, I need to visit the weenie factory soon. Then, laid gracefully on top of the dog is the chili verde. This is certainly a first for me, and a pretty unique, hipster-y topping. I am definitely a fan of it, but I’m not so sure it should be on a hot dog. If you’ve ever eaten flautas, this hot dog is essentially flautas plus a sausage. There are some mexican soft cheeses and diced onions on top as well that help cut the spice of the chili verde. The bun is toasted with care, and they even stuck a little American flag in it. How perfect is that? Obviously I enjoyed it. The weenie in general was kind of like that kid that you stay friends with only because he is interesting. You don’t want to hang out with him all the time, but every once in a while he provides a little spark to your drab, meaningless, mundane existence. Pop some chili verde on that bad boy and that’s the personality you’ll get in the dog. Good, but not great. Mexican, but American. Sauce, but not salsa. Ornate, not elegant. I would also like to point out that I did not plan on coming to this establishment, nor did I know they had hot dogs. 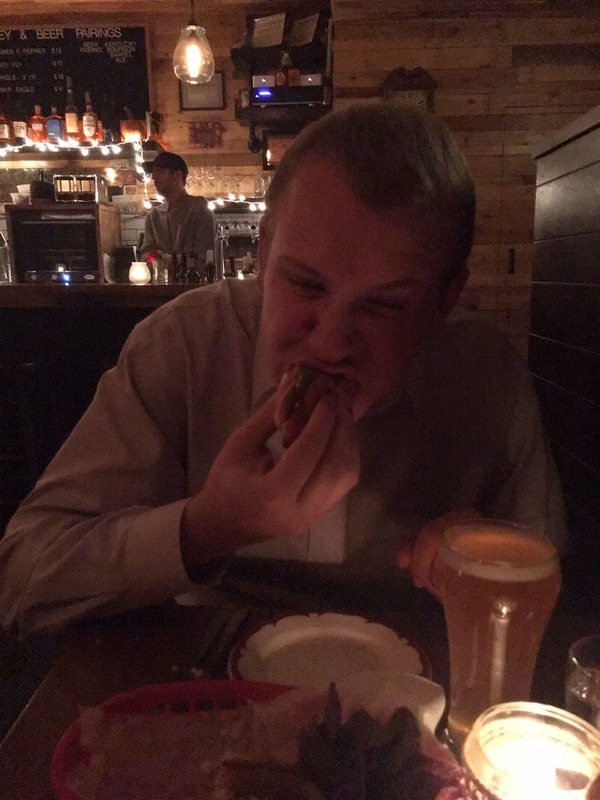 I was more than pleasantly surprised with the place in general and the fact that they had a gourmet hot dog on the menu. They specialize in beer and wine pairings and everything that they serve was really good. Go there.